your computer is rendering minecraft in real time. The higher the number, the better. run the jar file and click the button install. There should be no issues. It should look like this. need this number for step three. and turn on the last switch that says Advanced Options. my ram is 16. So i would change it to 8G. When completed it should look like this. like this. Remember to do this every other day, CCleaner will remind you to keep your computer clean aswell. 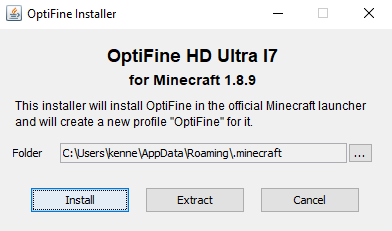 more than usual with optifine now. Please fill in all of the settings below into your minecraft client. remain on to your choice. of the boxes listed there. When done, click OK. It should look like this. Well done, very helpful for low end pcs or the people who use macs. i'm sure that could be helpful for a lot of people! nice guide, and thanks! Wow! This really works! Thanks so much! Sorry i didnt read this fully, but? you do know not all ppl got that much ram? so maybe more detail about that subject?